If I could eat pizza everyday, I would. 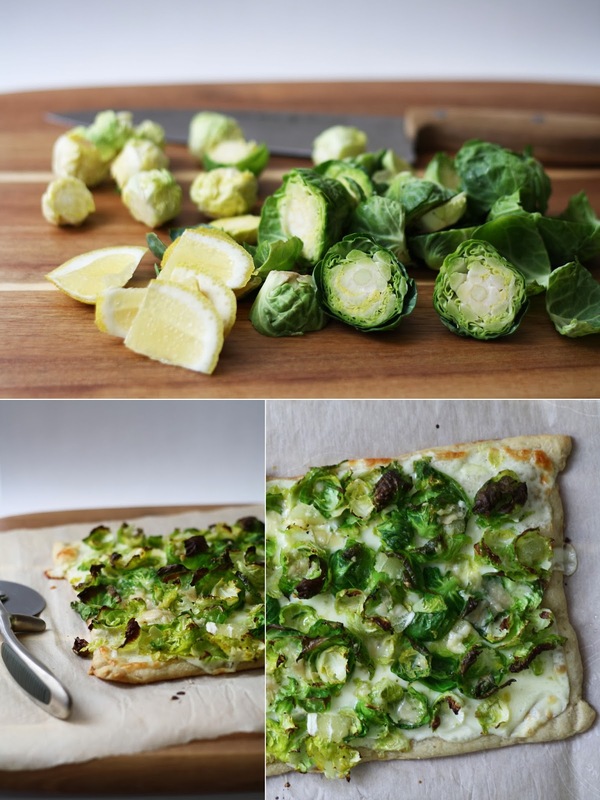 When I came across inspiration for this recipe, I got really excited about the idea of having crunchy brussels sprout leaves and tangy lemon on top of a pizza. This is the perfect dinner for a weeknight, and its super easy to throw together once you have all the ingredients. Had I been more adventurous, I would have attempted to make the dough, but alas, I turned to the trusty store bought kind. * Note: Follow the instructions on your pizza dough packaging for oven temp and baking time. I did mine at 400 for 12 minutes. Brush the pizza dough with olive oil and lay the mozzarella slices to cover the crust. Leave a 1/2" edge if you'd like. In a medium size bowl, toss the brussels sprout leaves with olive oil and pepper. Sprinkle the brussels sprouts over the pizza. Spread the lemon slices evenly throughout and top with grated parmesan.